OVER the weekend, Malaysian Prime Minister Dr Mahathir Mohamad gave an extraordinary pat-on-the-back to the Chinese community. His string of praises in paying tribute for their contributions to Malaysia’s development, will surely please Chinese globally, especially in China, where there appear to be a slight dip in bilateral confidence in recent months. Saying it from a sincere big heart, Mahathir made it clear that without them, the country would have been left behind. “They have contributed much to the development of many countries by becoming citizens of the countries. 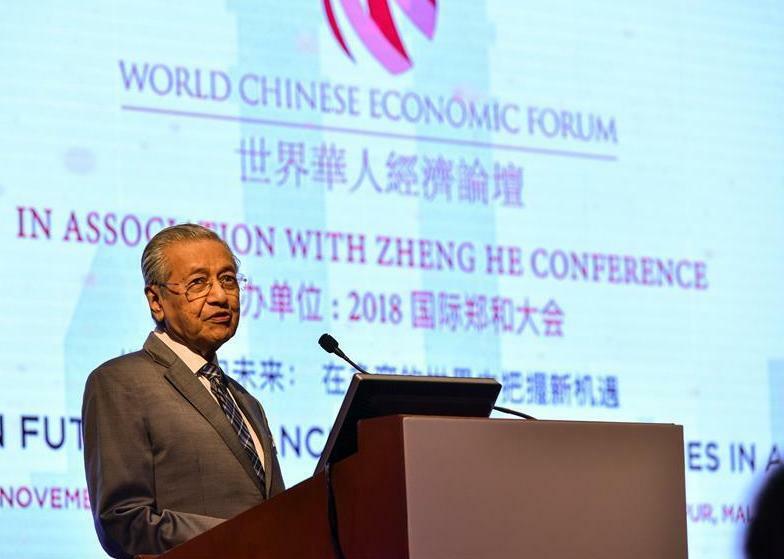 Certainly, in Malaysia, we have 30 per cent of the people made up of Chinese origin who are citizens of the country, he said in a key-note speech at the World Chinese Economic Forum (WCEF) in Kuala Lumpur on November 9. Specifically singling out the “spirit of the global Chinese community” Mahathir said that one could see Chinese people anywhere in the world, and not just in China alone. He noted that by and large, the Chinese are a peaceful people who contributed much to the development of the whole world. Mahathir also acknowledged the ability of the Chinese in creating wealth wherever they go, noting that they are business-oriented people, and that they know how to deal with money and business. “We all know it is the business people who create the wealth of the country. The government is good at collecting the wealth. Without the business people creating the wealth, the government can collect no wealth,” he said, drawing laughter from the audience. The Pakatan Harapan (PH) chairman stated that the Chinese contribution to the development of the country was not confined to business and profit-making, but also in many other fields. Mahathir also paid tribute to the ability of the Chinese in adapting to changing market conditions. He added: “Today’s business is not about opening shops along streets which was what they did when they came to Malaysia. The streets then were lined by Chinese shops, providing services of all kinds. “But the situation changed over time. Today, we see a complete change in the way goods are marketed. Now we have many shopping complexes where the shops are gathered in a place that is nicely air-conditioned,” he said. Just as the Chinese are able to make adjustments in the country they live in, Mahathir said they were also able to adjust to the developments of the world, which is now focused on the industrial revolution 4.0. “This is something that requires a complete change of attitude, and a complete change in terms of knowledge. “We are living in the knowledge age, and in this age, we need to have as much knowledge as we can in order to cope with the new ideas of how life will be, how business will be carried out. “We talk about artificial intelligence, thinking machines. I am told today that machines will be teaching us, and not us managing them. The world has changed. The way business is done has changed. I see the change in attitude in the way people take advantage of new technologies and discoveries,” he said. Calling on the Malaysian Chinese to further rise to the occasion, Mahathir said Malaysia will continue to benefit from Chinese enterprises and their ability to take advantage of the latest developments. “We are now entering the age of knowledge where machines can collect enormous amounts of data, and the machines can then analyse the data for us so that we can do things in a better way. “Indeed the machines can analyse data to the point where we will know what the future will be like, what people want, their choices and preferences, and knowing this, we can cope with new demands.